Each step in Clarify has a place for text and another for media (images). This article shows you how to specify which one appears right after the step title. With the step selected, open the step inspector (1) and change the Media Position setting (2). 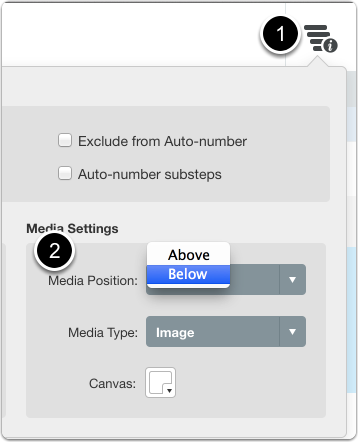 This setting specifies whether the media section appears above the text section or below the text section. I would like to position media to the right of the text. @Clay - we don't have an option to do that right now. I understand the program isn't a word processor but it would be nice to see some additional options here, like being able to place text above and below the image simultaneously. I'm trying to convert some of our older documentation, which we are happy with from a visual stand point, into something that is easier to maintain. Clarify is about the best we've used so far for the price, but I just wish it had slightly more control over the formatting without having to resort to HTML every time. @BL - The workaround is to create a second step with no title or image. If a step doesn't have a title or image then the instructions text will appear right after the previous step image. This gives you text both above and below an image. The technique will still work with numbered steps. Clarify doesn't count steps with no title when auto numbering them. The one step per page in PDF output would cause a problem though. I don't have a workaround for that. Do you have any ideas in the future of implementing predefined steps? What I mean is if I could predefine fore example a textbox which contains a standard text to the left of the image, so when adding a new step its already there. @John - at this time we don't currently have plans to add predefined steps.